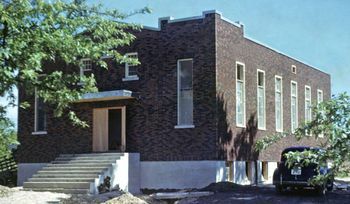 St. Catharines Mennonite Brethren Church, 1949. Scott Street MB Church, 2014. Mennonites arrived in Ontario in the 1920s from the Soviet Union. Originally they were hosted by Mennonites already residing in the province and settled in the Waterloo County area. Eventually they spread out from there, mostly to the west and south-east. In the Niagara peninsula area they formed the Niagara and Vineland congregations in the 1930s. Some of these families moved to St. Catharines and formed the St. Catharines Mennonite Brethren Church with 66 charter members on 6 November 1943. Gerhard J. Epp is considered the founding leader of the group. The congregation met in rented facilities for worship for several years. In 1949 they completed their own meeting house. In 1954 they built another meeting house at a new location to meet the increasing need for more space with a membership of 378. In 1964 they had again outgrown the space of this meeting house on Scott Street with a membership of 578 and so decided to form a daughter congregation which became the Fairview MB Church and the name of the remaining congregation was changed to the Scott Street MB Church. In 1965 the building was expanded. In 1966 the Tabor Home was founded next door for senior citizens. In 1973, with a membership of 632, a third congregation was formed which became the Grantham MB Church. The congregation had only German worship until 1970 and then had an English and German worship service until the 1980s. In 1980 the membership stood at 493. This was necessitated mainly by the large influx of members from South America. Later both the Fairview-Louth and Gateway congregations were founded in the St. Catharines area. The congregation voted to move to a single unified service of worship in English on 29 September 2011. Mennonite Brethren Herald (27 May 1988): 50; (18 February 1994): 19; (December 2011). Penner, Jacob. "The Organization and Development of the St. Catharines MB Church." 1957, 18 pp. Centre For Mennonite Brethren Studies. "The Story of the Mennonite Brethren Church of St. Catharines (Scott St. MB Church) 1943-1968." 1968, 46 pp. When Your Children Shall Ask: a History of the Ontario Conference of Mennonite Brethren Churches, 1957-1982. 1982: 53-56. Centre for Mennonite Brethren Studies, Winnipeg, MB. Friesen, Bert. "Scott Street Mennonite Brethren Church (St. Catharines, Ontario, Canada)." Global Anabaptist Mennonite Encyclopedia Online. January 2014. Web. 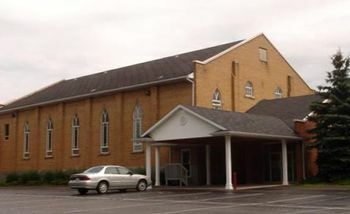 20 Apr 2019. http://gameo.org/index.php?title=Scott_Street_Mennonite_Brethren_Church_(St._Catharines,_Ontario,_Canada)&oldid=163158. Friesen, Bert. (January 2014). Scott Street Mennonite Brethren Church (St. Catharines, Ontario, Canada). Global Anabaptist Mennonite Encyclopedia Online. Retrieved 20 April 2019, from http://gameo.org/index.php?title=Scott_Street_Mennonite_Brethren_Church_(St._Catharines,_Ontario,_Canada)&oldid=163158. Adapted by permission of Herald Press, Harrisonburg, Virginia, from Mennonite Encyclopedia, Vol. 4, p. 401. All rights reserved. This page was last modified on 1 February 2019, at 23:58.